Media Release: Proposed bill fails to protect consumers from unproven medicines: Government legislation and the Therapeutic Goods Administration (TGA) are supposed to protect Australians when they purchase medicines. Prominent health authorities are warning that the Federal Government is trying to bypass these important safeguards. Science being ‘thrown out the window’ in Australia’s health policy, experts tell MPs: “Groups are concerned by amendments to the legislation that will abolish pre-clearing of complementary and alternative medicine advertisements. The bill will also authorise an industry-submitted list of permissible uses for complementary medicines, including 140 uses that must be supported by scientific evidence and 879 that can be supported by a tradition of use, such as use in Chinese medicine and homeopathy, which has no scientific evidence for its efficacy.” Traditional use of a substance is not evidence for its efficacy. This just sounds like woo for woo’s sake! 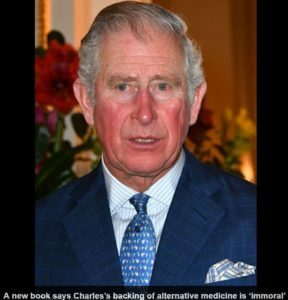 Charles under fire for ‘preaching homeopathy’: New book criticises the ‘immoral’ Prince and also attacks Boots for ‘ripping off’ customers by promoting alternative medicine: Prince Charles and Boots the chemist have been criticised again for promoting alternative medicine. A new book says Charles’s backing is ‘immoral’ while Boots is ‘contemptible’ for ‘ripping off’ customers by selling homeopathic remedies. The accusations are made in More Harm Than Good?, due to be published next month. Co-authors Edzard Ernst, a well-known sceptic of alternative medicine and former professor at Exeter University, and bioethicist Dr Kevin Smith accuse the prince of ‘publicly preaching’ about homeopathy as one of his ‘favourite anti-science superstitions’. Are guidelines for calcium and vitamin D rooted in evidence, or vested interests? “Grey and Bolland believe that there is a web of industry, advocacy and academia that keeps vitamin D and calcium in osteoporosis treatment guidelines. They do not believe these products have any value in the prevention and treatment and osteoporosis, and this, they conclude, must be the reason that they persist in the guidelines. Taking out Occam’s razor, I can describe a second scenario, which I think is more plausible. The role of calcium and vitamin D in the prevention and treatment is indeed controversial. Integrative medicine questioned: ”Nonspecific factors, including the effects of application of localized irritants and the effects of the patient-clinician interaction such as conditioning, positive patient expectations, and reduced patient vigilance, appear to account for much of the therapeutic benefits associated with acupuncture treatment”. The Dark Side of Melatonin: As I do my reading for my PhD, I look up a lot of different compounds to make sure I am up to date. I am surprised at how many of these compounds are advertised as supplements, many making very dubious claims about their various health benefits. The following article discusses melatonin supplementation and brings up the crux of the matter. Melatonin can be a useful supplement in given circumstances (it’s supposed to be good for overcoming jet-lag). But taking it as a sleeping aid daily is not a good idea. And since the supplement industry is not regulated, vendors offer tablets containing doses far in excess of what health professionals would recommend. These companies only want to maximise their profits, they don’t care about your health. So when it comes to supplements, don’t trust what you read. Talk to your doctor or pharmacist about the usefulness of various supplements and their recommended dosages, before you do yourself needless harm. Fibre is good for you – now scientists may know why: A diet of fibre-rich foods, such as fruits and vegetables, reduces the risk of developing diabetes, heart disease and arthritis. Indeed, the evidence for fibre’s benefits extends beyond any particular ailment: People who eat more of it simply have lower odds of dying. Cesarean section history: The improved safety of the Cesarean section. Although a practice that is many thousands of years old, only with medical and surgical advancements has this method of delivery been able to be performed safely not just without causing the death of the mother, but often to save the life of the mother. Sometimes regarded as “the only operation that can save two lives”.